But Rosemary gets more than she bargained for with theWayfarer. The crew is a mishmash of species and personalities, from Sissix, the friendly reptillian pilot, to Kizzy and Jenks, the constantly sparring engineers who keep the ship running. Life on board is chaotic, but more or less peaceful – exactly what Rosemary wants. The Long Way to a Small Angry Planet is without question one of the best books I’ve read this year, and I am sad that it took me so long to get to it. 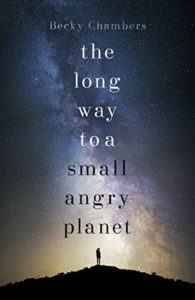 Optimistic space opera, space ships, friendship, found family, a wonderful array of characters I fell in love with immediately and the most interesting take on wormhole construction yet. This book hits almost every button I think I have for stories that make me fall in love instantly. I got galactic civilisations, thoughtful interesting alien cultures which were neither tokenised nor stereotyped. Space travel and flight really involved the travelling part and that was an excellent part of the story narrative. I loved that I got a sense of what it was like to be part of a crew on a ship where there could be many weeks between docking into ports and what that looks like in terms of interpersonal skills and ship management. Oh, the emotional intelligence work involved here it was just gorgeous! I’m all a-swoon about it. Rosemary is our main point of view character and she’s initially quite a mystery, she withholds so much of herself that you almost risk not liking her, and then it all kind of comes tumbling out and instead you want to make her a cup of tea and make friends. I loved the interactions between the other crew members and each other, especially resolving conflicts, of which there is a major one and it was particularly satisfying in how that eventuated. I loved the way that bad things happen, there is injustice, corruption, greed, and struggling, but that this is handled deftly by the author and that there is the feelgood emotional payoff in resolution or simply in acknowledging the reality and letting it be there – without making it worse or hammering it in such a way that leaves me raw. There’s a realism in the way it’s presented that I value, but it’s not out to traumatise me, it’s not the point of the story, it’s just part of the ordinary background that makes up a world. You can tell a story and have it focus on the positive outlook, without shunning conflict, upset, or bad things happening – you go through everything with the characters, but the author brings you safely out the other side. There’s comfort and catharsis in that. It’s a big reason why I fell so hard for this book and why it’s an instant favourite. I love the way in which this is a story of inclusiveness, but it’s never heavy handed. There are queer relationships and characters, disabilities and differing sometimes clashing cultural and racial considerations that are all noticeable, but not as tick boxes. They’re part of a three-dimensional texture about this book, they build on the story and the characters, they’re never trite. This book is like taking a deep breath of fresh air, and being hugged by all its wonderful words. I’m so in love with this.